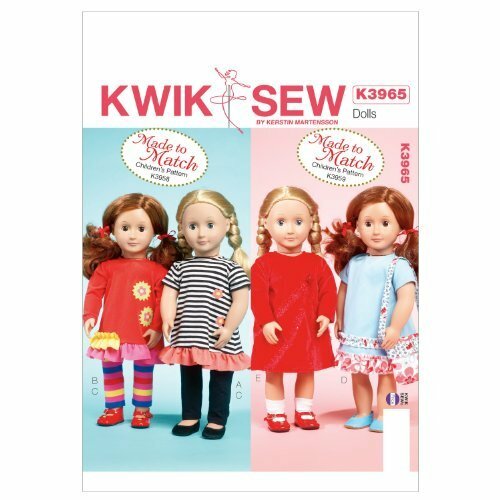 Kwik Sew Patterns K3965 Clothes for 18-Inch Doll Sewing Template, One Size / One Size Only. Includes pattern pieces and sewing instructions. Made by Kwik Sew. Copyright? 2038. Printed in the USA. . DESIGNED FOR TWO-WAY STRETCH KNITS ONLY WITH 35-percent STRETCH ACROSS THE GRAIN. CONTRAST D, E AND PURSE E: DESIGNED FOR WOVEN FABRICS. Suggested Fabrics: Interlock, Jersey, Stretch Velvet. Contrast D, E and Purse E: Cotton organza, Silk. NOTIONS: Thread. View A, B: 1/4 -yard (0. 30 m) of 3/8-inch (1. 00 cm) wide Velcro, scraps of fabrics for appliqu?s, paper-backed fusible webbing. View C: 1/4 -yard (0. 30 m) of 1/4-inch (6 mm) wide elastic. View D: 1/4 -yard (0. 30 m) of 3/8-inch (1. 00 cm) wide Velcro, one purchased flower. View E: 1/4 -yard (0. 30 m) of 3/8-inch (1. 00 cm) wide Velcro, two 3/8-inch (1. 00 cm) buttons. Made to Match K3958. One Size Only. Includes pattern pieces and sewing instructions. Made by Kwik Sew. Copyright? 2038. Printed in the USA. .